Toronto: Historical Publishing Co, 1902. Hardcover. Very good. Edition of 1000 copies. This copy not numbered. lviii, 320 p., interspersed with illustrations. 25 cm. 19 b&w illustrations, 5 p. facsimile letter, 6 maps. Red cloth hardcover with gold lettering. Respined with new spine label. Ink stamp on front cover. Corners worn. Signed on front free endpaper by the author to Niagara area historian. Ink stamp to p. 25 and plate opposite p. 105. Rough page edges. 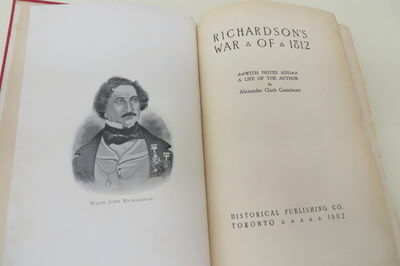 Richardson's text describes Hull's invasion of Canada, the capture of Michilimackinac, Brownstown and Maguaga, Brock's capture of Detroit, the Battle of Queenston Heights, the Battle of Moraviantown, treatment of prisoners of war, and much more. An interesting addition to a collection on the War of 1812. Includes biography of Richardson by Casselman. Note inscription to Janet Carnochan (1839-1926), educator and historian, who in 1895 became president of the newly established Niagara Historical Society. Her History of Niagara, printed by William Briggs in Toronto, appeared in 1914.